How can I split a route or concatenate fragments? Select a route and also select a range in the elevation chart. Then choose the command to trim the route to the selection in the chart. 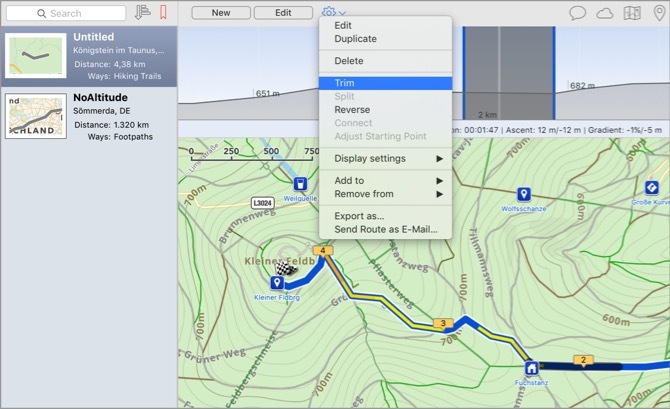 Select a route and also select a location in the elevation chart. Then choose the command to split the route at the selection into two route fragments. Select a route and choose the command to reverse the course direction. In other words to make the end point the new start. Select two route fragments and choose the command to join the two fragments into one concatenated route. Select a route, preferably a round trip, and select a location in the chart. Then choose the command to set the starting point of the round trip to the select position making the old start point a simple transit location on the course of the resulting route.